After removing the handle of my Lincoln Mark VIII, I can't get the new handle in a position to reach the bar that makes the car lock. I have tried to maneuver the handle, put it in sideways and I can't make it reach. The locking bar sticks up about an inch higher than part of the handle it should slip into. If there is anyone who has any advice, I would appreciate it. Thank you. is this a 79 or an 86 or a 93? It was built in 1998. I put the handle in and srewed it on and that helps it reach better, but the bar faces horizontal at the top and the hole for the handle is vertical. If anyone knows the answer, I still need help. Thank you. Is this the outer or inner handle? It is the outer handle. 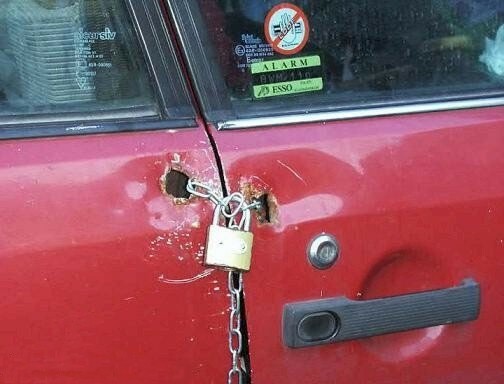 I had to have my door back together in order to drive my car again, so I fastened the lock to the handle with a pull tie. Thanks anyway. I had to have my door back together in order to drive my car again, so I fastened the lock to the handle with a pull tie. Maybe you need a little duct tape too. Hey, MacGyver did stuff like that all the time and it worked for him. If you can't do it the right way, you can always count on plan B. Plus, the guy at Autozone agreed with me that the pull ties were a good idea. He was the one I bought them from. Plus, the guy at Autozone agreed with me that the pull ties were a good idea. He was the one I bought them from. You do realize that taking advice from those guys is equivalent to asking your cat how to fix the TV. Woah woah woah. i work at advance auto and the guys i work with other than 2 actually know their stuff lol. If you're smart, you'll keep that a secret. Hey we dont tell customers this code means this is the problem. So you need this. We tell this is a list of possible issues but is not for sure going to fix it since we cant do yhe proper tests here, and we only recommend parts if we know what thats the issue otherwise its heres your code we cant help with that so for any more information youll have to go to a shop. Thats at my store anyways i have been to autozones and i dont like them at all. Maybe your store has the sense to do that, but realize most of them push for sales with next to no knowledge. If you look at enough of the posts just on this site, you'll find many a victim of the counter monkeys.